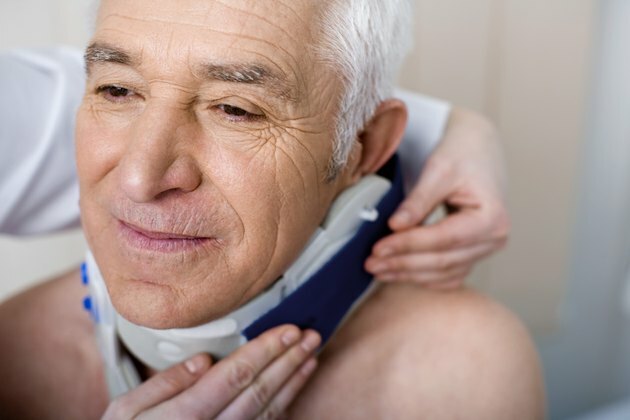 First responders at an accident scene are usually the ones to place a cervical collar around an injured person's neck to protect his vertebrae (neck bones) from moving erratically. This plastic or foam brace is secured carefully around the neck to limit the motion of your upper spine. There are specific steps to keep in mind when putting on a cervical collar. Lie the patient supine (face up) and have someone stand or kneel at the head of the patient. Have her firmly cup her hands over the patient's ears. This will serve to stabilize the patient's neck before rolling him. Roll the patient's entire torso to his left side and do not bend or twist the neck. Watch that your helper continues to cup the patient's ears and keeps the neck aligned with the rest of his body as you move him. Place the back of the cervical collar around the patient's neck and make sure it is centered. Roll the patient onto his back again and make sure the neck remains stabilized. Hold the front of the cervical collar and place it over the patient's neck. Slide the cervical collar up underneath the chin and make sure it is snug. Hold the side flaps of the front cervical collar so that it is pointing toward the patient's ears. Check that the cervical collar does not rest on the patient's clavicle (collar bone). Move the side flaps of the front cervical collar toward the back part of the cervical collar. Tighten the velcro straps on either side of the cervical collar. Make sure the Velcro straps are equally placed on both sides so that the cervical collar is secure. You successfully put on a cervical collar. Make sure the patient's chin cannot slide inside or outside of the cervical collar. Make sure the hole in the middle of the cervical collar is centered over the patient's neck. Make sure the patient's skin is clean before securing the cervical collar. Check the patient's skin underneath the collar every day, since irritation and sores can develop.